For the American musician, see Mark McGuire (musician). 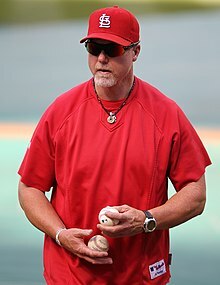 Mark David McGwire (born October 1, 1963), nicknamed Big Mac, is an American former professional baseball first baseman. His Major League Baseball (MLB) playing career spanned from 1986 to 2001 while playing for the Oakland Athletics and the St. Louis Cardinals, winning one World Series championship each with Oakland as a player in 1989 and with St. Louis as a coach in 2011. One of the most prolific home run hitters in baseball history, McGwire holds the major league career record for at bats per home run ratio (10.6), and is the former record holder for both home runs in a single season (70 in 1998) and home runs hit by rookie (49 in 1987). He ranks 11th all time in home runs with 583, and led the major leagues in home runs in five different seasons, while establishing the major league record for home runs hit in a four-season period from 1996−1999 with 245. Further, he demonstrated exemplary patience as a batter, producing a career .394 on-base percentage (OBP) and twice leading the major leagues in bases on balls. Injuries cut short the manifestation of even greater potential as he reached 140 games played in just eight of 16 total seasons. A right-handed batter and thrower, McGwire stood 6 feet 5 inches (1.96 m) tall and weighed 245 pounds (111 kg) during his playing career. From Pomona, California, the Athletics chose McGwire with the 10th overall selection in the 1984 MLB draft, and he was a member of the silver medal-winning entry of the United States national team that same year at the Summer Olympics in Los Angeles. As a rookie in 1987, he quickly grabbed media attention with 33 home runs before the All-Star break, and would lead the major leagues in home runs that year with 49, while setting the single-season rookie record. He appeared in six straight All-Star Games from 1987 to 1992 despite a brief career decline related to injuries. Another string of six consecutive All-Star appearances followed from 1995 to 2001. Each season from 1996 to 1999, he again led the major leagues in home runs. A part of the 1998 Major League Baseball home run record chase of Roger Maris' 61 with the Cardinals, McGwire set the major league single-season home run record with 70, which Barry Bonds broke three years later with 73. McGwire also led the league in runs batted in, twice in bases on balls and on-base percentage, and four times in slugging percentage. Injuries significantly cut into his playing time in 2000 and 2001 before factoring into his retirement. He finished with 583 home runs, which was fifth all-time when he retired. For his career, McGwire averaged a home run once every 10.61 at bats, the best at bats per home run ratio in baseball history (Babe Ruth is second at 11.76). He was the fastest player to hit 500 home runs, in 5,487 at-bats. McGwire was a central figure in baseball's steroids scandal. In 2010, McGwire publicly admitted to using performance-enhancing drugs during a large portion of his career. In his first ten years of eligibility, McGwire has not been elected into the National Baseball Hall of Fame. McGwire was born in Pomona, California. His father was a dentist. He attended Damien High School in La Verne, California, where he played baseball, golf, and basketball. He was drafted by the Montreal Expos in the 1981 amateur draft but did not sign. He played college baseball at the University of Southern California (where he was a teammate of Randy Johnson and Jack Del Rio) under coach Rod Dedeaux. After three years at Southern California and a stint on the 1984 U.S. Olympic team, the Oakland Athletics drafted McGwire tenth overall in the 1984 Major League Baseball draft. In a short cameo, McGwire debuted in the major leagues in August 1986, hitting three home runs and nine runs batted in in 18 games. Retaining his rookie status in 1987, McGwire took center stage in baseball with his home runs. He hit just four in the month of April, but followed in May with 15, and another nine in June. Before the All-Star break arrived, he totaled 33 HR and earned a spot on the American League (AL) All-Star team. On August 11, he broke Al Rosen's AL rookie record of 37 home runs. Three days later, McGwire broke the major league record of 38, which Frank Robinson and Wally Berger jointly held. In September, McGwire hit nine more home runs while posting monthly personal bests of a .351 batting average, .419 on-base percentage (OBP) and 11 doubles (2B). With 49 HR and two games remaining in the regular season, he chose to sit them out with an opportunity for 50 home runs to be present for the birth of his first child. McGwire also totaled 118 runs batted in (RBI), .289 batting average, 97 runs scored, 28 doubles, a .618 slugging percentage and a .370 on-base percentage (OBP). McGwire's 49 home runs as a rookie stood as a major league record until Aaron Judge hit 52 for the New York Yankees in 2017. Not only did he lead the AL in home runs in 1987, but he also tied for the major league lead with Chicago Cubs right fielder Andre Dawson. McGwire also led the major leagues in SLG, finished second in the AL in adjusted on-base plus slugging percentage (OPS+, 164) total bases (344), third in RBI and on-base plus slugging (OPS, .987). He was thus a unanimous choice for the AL Rookie of the Year Award and finished sixth overall in the AL Most Valuable Player Award voting. From 1988 to 1990, McGwire followed with 32, 33, and 39 home runs, respectively, becoming the first Major Leaguer to hit 30+ home runs in each of his first four full seasons. On July 3 and 4, 1988, he hit game-winning home runs in the 16th inning of both games. Through May 2009, McGwire was tied for third all-time with Joe DiMaggio in home runs over his first two calendar years in the major leagues (71), behind Chuck Klein (83) and Ryan Braun (79). McGwire's most famous home run with the A's was likely his game-winning solo shot in the bottom of the ninth inning of Game 3 of the 1988 World Series against the Los Angeles Dodgers and former A's closer Jay Howell. McGwire's game-winner brought the A's their only victory in the 1988 World Series, which they lost in five games. However, Big Mac and his fellow Bash Brother, José Canseco, played a large part in the 1989 championship club that defeated the San Francisco Giants in the famous "Earthquake Series". Working diligently on his defense at first base, McGwire bristled at the notion that he was a one-dimensional player. He was generally regarded as a good fielder in his early years, even winning a Gold Glove Award in 1990 – the only one that New York Yankees legend Don Mattingly would not win between 1985 and 1994. In later years, his mobility decreased and, with it, his defense. However, McGwire's batting averages after his rookie season plummeted to .260, .231, and .235 from 1988 to 1990. In 1991, he bottomed out with a .201 average and 22 homers. Manager Tony La Russa sat him out the final game of the season to avoid allowing his batting average to dip below .200. Despite the declining averages during this time of his career, his high bases on balls totals allowed him to maintain acceptable OBPs. In fact, when he hit .201, his OPS+ was 103, or just over league average. McGwire stated in an interview with Sports Illustrated that 1991 was the "worst year" of his life, with his on-field performance and marriage difficulties, and that he "didn't lift a weight" that entire season. With all that behind him, McGwire re-dedicated himself to working out harder than ever and received visual therapy from a sports vision specialist. The "new look" McGwire hit 42 homers and batted .268 in 1992, with an outstanding OPS+ of 175 (the highest of his career to that point), and put on a home run hitting show at the Home Run Derby during the 1992 All-Star break. His performance propelled the A's to the American League West Division title in 1992, their fourth in five seasons. The A's lost in the playoffs to the eventual World Series champion, the Toronto Blue Jays. Foot injuries limited McGwire to a total of 74 games in 1993 and 1994, and just 9 home runs in each of the two seasons. He played just 104 games in 1995, but his proportional totals were much improved: 39 home runs in 317 at-bats. In 1996, McGwire belted a major league leading 52 homers in 423 at-bats. He also hit a career high .312 average, and led the league in both slugging percentage and on-base percentage. 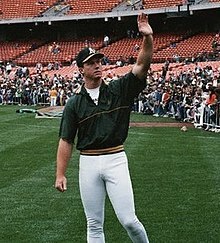 McGwire's total of 363 home runs with the Athletics surpassed the previous franchise record. He was selected or voted to nine American League All-Star Teams while playing for the A's, including six consecutive appearances from 1987 through 1992. He was one of only four players to hit a ball over the roof in the left field of Tiger Stadium. On July 31, having already amassed 34 home runs to this point in the 1997 season, McGwire was traded from the Oakland Athletics to the St. Louis Cardinals for T. J. Mathews, Eric Ludwick and Blake Stein. Despite playing just two-thirds of the season in the American League, he finished ninth in HR. In 51 games with the Cardinals to finish 1997 off, McGwire compiled a .253 batting average, 24 home runs, and 42 RBI. Overall in 1997, combined with both teams, McGwire led the majors with 58 home runs. He also finished third in the major leagues in slugging percentage (.646), fourth in OPS (1.039), fifth in OPS+ (170), tenth in RBI (123), and ninth in walks (101). He placed 16th in the NL MVP voting. It was the last year of his contract, so there was speculation that McGwire would play for the Cardinals only for the remainder of the season, then seek a long-term deal, possibly in Southern California, where he still lives. However, McGwire signed a contract to stay in St. Louis instead. It is also believed that McGwire later encouraged Jim Edmonds, another Southern California resident who was traded to St. Louis, to forgo free agency and sign a contract with the Cardinals in 2000. As the 1998 season progressed, it became clear that McGwire, Seattle Mariners outfielder Ken Griffey Jr., and Chicago Cubs outfielder Sammy Sosa were all on track to break Roger Maris' single-season home run record. The race to break the record first attracted media attention as the home run leader changed often throughout the season. On August 19, Sosa hit his 48th home run to move ahead of McGwire. However, later that day McGwire hit his 48th and 49th home runs to regain the lead. On September 8, 1998, McGwire hit a pitch by the Cubs' Steve Trachsel over the left field wall for his record-breaking 62nd home run, setting off massive celebrations at Busch Stadium. The fact that the game was against the Cubs meant that Sosa was able to congratulate McGwire personally on his achievement. Members of Maris' family were also present at the game. The ball was freely, albeit controversially, given to McGwire in a ceremony on the field by the stadium worker who found it. McGwire finished the 1998 season with 70 home runs (including five in his last three games), four ahead of Sosa's 66, a record that was broken three seasons later in 2001 by Barry Bonds with 73. McGwire was honored with the inaugural Babe Ruth Home Run Award for leading MLB in home runs. Although McGwire had the prestige of the home run record, Sammy Sosa (who had fewer HR but more RBI and stolen bases) won the 1998 NL MVP award, as his contributions helped propel the Cubs to the playoffs (the Cardinals in 1998 finished third in the NL Central). Many credited the Sosa-McGwire home run chase in 1998 with "saving baseball", by both bringing in new, younger fans and bringing back old fans soured by the 1994–95 Major League Baseball strike. McGwire kept his high level of offensive production from 1998 going in 1999 while setting or extending several significant records. For the fourth consecutive season, he led MLB in HR with 65. It was also his fourth consecutive season with at least 50 HR, extending his own major league record. Sosa, who hit 63 HR in 1999, again trailed McGwire. Thus, they became the first – and still only – players in major league history to hit 60 or more home runs in consecutive seasons. McGwire also set a record from 1998 to 1999 for home runs in a two-season period with 135. Further, he owned the highest four-season HR total, with 245 from 1996 to 1999. In 1999, he drove in an NL-leading 147 runs while only having 145 hits, the highest RBI-per-hit tally for a season in baseball history. Statistically in 2000 and 2001, McGwire's numbers declined relative to previous years as McGwire struggled to avoid injury (32 HR in 89 games, and 29 HR in 97 games, respectively). He retired after the 2001 season. After his playing career ended, McGwire demonstrated coaching ability, personally assisting players such as Matt Holliday, Bobby Crosby and Skip Schumaker before accepting an official role as hitting coach with an MLB team. On October 26, 2009, Tony La Russa, then manager of the Cardinals, confirmed that McGwire would become the club's fifth hitting coach of his tenure with the Cardinals, replacing Hal McRae. McGwire received a standing ovation prior to the Cardinals home opener on April 12, 2010. In his three seasons as Cardinals hitting coach, they featured a prolific offense that led the National League in hitting and on-base percentage, and were second in runs. In early November, 2012, McGwire rejected a contract extension to return as Cardinals hitting coach for the 2013 season. Instead, he accepted an offer for the same position with the Los Angeles Dodgers, in order to be closer to his wife and five children. On June 11, 2013, McGwire was ejected for the first time as a coach during a bench-clearing brawl with the Arizona Diamondbacks. He was suspended for two games starting the next day. On December 2, 2015, he was named the new bench coach for the San Diego Padres. He left the team after the 2018 season. Probably best known as one of the top sluggers of his era, McGwire ended his career with 583 home runs, which was fifth-most in history when he retired. When he hit his 500th career home run in 1999, he did so in 5,487 career at bats, the fewest in major league history. He led all MLB in home runs in five different seasons, including 1987 and each season from 1996 to 1999. Totaling 245 home runs from 1996−99, it was the highest four-season home run output in major league history. Further, in each of those four seasons, he exceeded 50 home runs, becoming the first player to do so. He was also the first player to hit 49 or more home runs five times, including his rookie-season record of 49 in 1987. With a career average of one home every 10.61 at-bats, he holds the MLB record for most home runs per at-bat by over a full at-bat more than second-place Babe Ruth (11.76). As of 2015, McGwire owned three of the four lowest single-season AB/HR ratios in MLB history, which covered his 1996, 1998 and 1999 seasons. They were actually the top three seasons in MLB history until Bonds broke his single-season HR record in 2001. McGwire's 1997 season ranked 13th. Considered one of the slowest running players in the game, McGwire had the fewest career triples (six) of any player with 5,000 or more at-bats, and had just 12 stolen bases while being caught stealing eight times. In 1999, The Sporting News released a list of the 100 Greatest Baseball Players, ranking McGwire at number 91. The list had been compiled during the 1998 season and included statistics through the 1997 season. That year, he was elected to the Major League Baseball All-Century Team. In 2005, The Sporting News published an update of their list, and McGwire had been moved up to Number 84. McGwire first became eligible for Hall of Fame voting in 2007. For election, a player needs to be listed on 75% of ballots cast; falling under 5% removes a player from future consideration. Between 2007 and 2010 McGwire's performance held steady, receiving 128 votes (23.5%) in 2007, 128 votes (23.6%) in 2008, 118 votes (21.9%) in 2009, and 128 votes (23.7%) in 2010. The subsequent ballot in 2011 showed the first sub-20% total of 115 votes (19.8%), and McGwire's total votes continued to decline (112 votes (19.5%) in 2012, 96 votes (16.9%) in 2013, 63 votes (11.0%) in 2014, and 55 votes (10.0%) in 2015) until he was finally eliminated after receiving only 54 votes (12.3%) in 2016. A portion of Interstate 70 (see also: Interstate 70 in Missouri) in St. Louis and near Busch Stadium was named "Mark McGwire Highway" to honor his 70 home run achievement, along with his various good works for the city. In May 2010, St. Louis politicians succeeded in passing a state bill to change the name of "Mark McGwire Highway", a 5-mile stretch of Interstate 70, to "Mark Twain Highway". In a 1998 article by Associated Press writer Steve Wilstein, McGwire confessed to taking androstenedione, an over-the-counter muscle enhancement product that had already been banned by the World Anti-Doping Agency, the NFL, and the IOC. At the time, however, use of the substance was not prohibited by Major League Baseball and it was not federally classified as an anabolic steroid in the United States until 2004. Jose Canseco released a book, Juiced: Wild Times, Rampant 'Roids, Smash Hits & How Baseball Got Big, in 2005. In it, he wrote positively about steroids and made various claims—among them, that McGwire had used performance-enhancing drugs since the 1980s and that Canseco had personally injected him with them. Asking me or any other player to answer questions about who took steroids in front of television cameras will not solve the problem. If a player answers 'No,' he simply will not be believed; if he answers 'Yes,' he risks public scorn and endless government investigations ... My lawyers have advised me that I cannot answer these questions without jeopardizing my friends, my family, and myself. I will say, however, that it remains a fact in this country that a man, any man, should be regarded as innocent unless proven guilty. On January 11, 2010, McGwire admitted to using steroids on and off for a decade and said, "I wish I had never touched steroids. It was foolish and it was a mistake. I truly apologize. Looking back, I wish I had never played during the steroid era." He admitted using them in the 1989/90 offseason and then after he was injured in 1993. He admitted using them on occasion throughout the 1990s, including during the 1998 season. McGwire said that he used steroids to recover from injuries. McGwire's decision to admit using steroids was prompted by his decision to become hitting coach of the St. Louis Cardinals. According to McGwire, he took steroids for health reasons rather than to improve performance; however, a drug dealer who claimed to have provided steroids to McGwire asserted that his use was to improve his size and strength, rather than to just maintain his health. McGwire's brother Dan McGwire was a quarterback for the Seattle Seahawks and Miami Dolphins of the NFL in the early 1990s, and was a first-round draft choice out of San Diego State University. He has another brother, Jay McGwire, a bodybuilder, who wrote a book in 2010 detailing their shared steroid use. McGwire married Stephanie Slemer—a former pharmaceutical sales representative from the St. Louis area—in Las Vegas on April 20, 2002. On June 1, 2010, their triplet girls were born: Monet Rose, Marlo Rose, and Monroe Rose. They join brothers Max and Mason. They reside in a gated community in Shady Canyon Irvine, California. Together they created the Mark McGwire Foundation for Children to support agencies that help children who have been sexually and physically abused come to terms with a difficult childhood. Mark has a son, Matthew (b. 1987), from a previous marriage (1984–1990, divorced) to Kathleen Hughes. Prior to admitting to using steroids, McGwire avoided the media and spent much of his free time playing golf. He also worked as a hitting coach for Major League players Matt Holliday, Bobby Crosby, Chris Duncan and Skip Schumaker. McGwire appeared as himself in season 7, episode 13 of the sitcom Mad About You. McGwire provided his voice for an episode of The Simpsons titled "Brother's Little Helper", where he played himself. ^ "Progressive Leaders & Records for Home Runs". Baseball-Reference.com. Retrieved November 7, 2012. ^ a b ""Bonds testified that substances didn't work", ESPN.com, December 4, 2004, accessed 02/03/11". Sports.espn.go.com. December 4, 2004. Retrieved November 7, 2012. ^ "Mark McGwire Stats | Baseball-Reference.com". Baseball-Reference.com. Retrieved March 17, 2017. ^ a b c "Career Leaders & Records for at bats per home run". Baseball-Reference.com. Archived from the original on February 28, 2009. Retrieved November 7, 2012. ^ a b c "500 Home Run Details". Baseball-Almanac.com. Retrieved February 3, 2015. ^ Kepner, Tyler. "McGwire Admits That He Used Steroids - NYTimes.com". ^ Jaffe, Jay. "McGwire gets second HOF shot, but is he worthy?". ^ "Mark McGwire Stats - Baseball-Reference.com". Baseball-Reference.com. ^ "Yankees' Aaron Judge breaks Mark McGwire's rookie HR record". Sporting News. September 26, 2017. Retrieved December 2, 2017. ^ a b "Mark McGwire Statistics". Baseball-Reference.com. Retrieved November 7, 2012. ^ "July 3, 1988 Oakland Athletics at Toronto Blue Jays play by play and box score". Baseball-Reference.com. July 3, 1988. Retrieved November 7, 2012. ^ "July 4, 1988 Oakland Athletics at Cleveland Indians Jays play by play and box score". Baseball-Reference.com. July 4, 1988. Retrieved November 7, 2012. ^ "October 18, 1988 World Series Game 3 at Network Associates Coliseum Play by Play and Box Score". Baseball-Reference.com. October 18, 1988. Retrieved November 7, 2012. ^ "1989 World Series – OAK vs. SFG". Baseball-Reference.com. Retrieved November 7, 2012. ^ "THE BIG DEALS / THE A'S / McGwire finally traded -- to Cards". ^ "Myth of men who saved baseball". March 30, 2005 – via www.nytimes.com. ^ "Baseball-reference.om McGwire stats". Baseball-Reference.com. Retrieved November 7, 2012. ^ "McGwire to speak, but date not set: Cards GM hopeful new hitting coach will appear soon". MLB.com. January 7, 2010. Retrieved January 11, 2010. ^ Hernandez, Dylan (November 2, 2012). "Mark McGwire expected to be Dodgers' hitting coach". The Los Angeles Times. Retrieved November 3, 2012. ^ Gurnick, Ken (November 2, 2012). "Report: McGwire to become Dodgers' hitting coach". MLB.com via St. Louis Cardinals website. Retrieved November 3, 2012. ^ "Report: Mark McGwire close to joining Los Angeles Dodgers as hitting coach". Yahoo sports. November 2, 2012. Retrieved November 2, 2012. ^ "MLB Ejections 071, 072, 073, 074, 075, 076: Clint Fagan (3–8)." Close Call Sports/Umpire Ejection Fantasy League. June 12, 2013. ^ "Mark McGwire not returning as Padres' coach to spend time with family". ESPN. AP. October 23, 2018. Retrieved October 26, 2018. ^ "Single-season leaders & records for AB per HR". Baseball-Reference.com. Retrieved June 18, 2015. ^ "2016 Hall of Fame Voting - Baseball-Reference.com". Baseball-Reference.com. ^ McCollough, J. Brady (July 6, 2010). "McGwire learning the 'art of coaching' as hitting instructor with the Cardinals". Pittsburgh Post-Gazette. ^ "Who Knew?". ESPN.com. September 11, 2005. Retrieved December 22, 2010. ^ "CNN.com". CNN. March 18, 2005. Retrieved May 12, 2010. ^ "McGwire admits steroids use". ESPN. January 11, 2010. ^ "Steroid supplier disputes McGwire's motive". MLB.com. January 22, 2010. ^ "McGwire admits to steroid use: Will appear on MLB Network tonight to discuss admission". MLB.com. January 11, 2010. ^ "Book: McGwire's brother shares steroids secrets". ESPN.com. February 24, 2010. ^ Ryon, Ruth (March 2, 2008). "A Moorish fantasy in Irvine's Shady Canyon". Los Angeles Times. Retrieved May 19, 2008. ^ "ESPN.com – E-Ticket: Fading Away". Sports.espn.go.com. Retrieved November 7, 2012. Lupica, Mike (1999). Summer of '98: When Homers Flew, Records Fell, and Baseball Reclaimed America. Chicago: Contemporary Books. Wikimedia Commons has media related to Mark McGwire.